This is the first title in SAREM’s Series A, Mammalogical Research. It provides information about the biology of caviomorph rodents, with contributions by 32 experts. 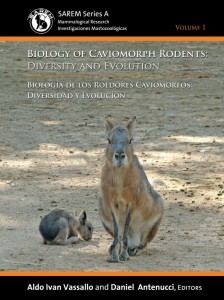 Caviomorph rodents evolved in South America, diversifying in shape and size and occupying disparate habitats. Because of their diversity and their peculiar evolutionary history, they are particularly interesting for biologists. Throughout its chapters, this volume provides new and updated information on caviomorph skeletal morphology, their locomotor behavior, size range, physiology, social and reproductive structure, and ecological relationships. The historical dimension is not overlooked: biogeography, genetic studies, and phylogenetic relationships of living and extinct representatives are also covered. We hope that such an integrative approach to the study of caviomorphs will also shed light on more general issues in evolutionary biology.